I have never been one to find Gantt charts particularly useful beyond the planning stage. For a long project that spans many months, scrolling across a Gantt chart just doesn't feel intuitive. And it can be difficult to picture the impact on your project calendar. I mean a REAL calendar. One of the new features in Statdash is the ability to view your dashboard in a calendar format. Below you will see a screen shot of a sample project. You can drag and drop your activities, stretch them to have a longer duration and click on each one to view descriptive information. As with any calendar, you can easily switch between month, week and day views and go forward and back through time. 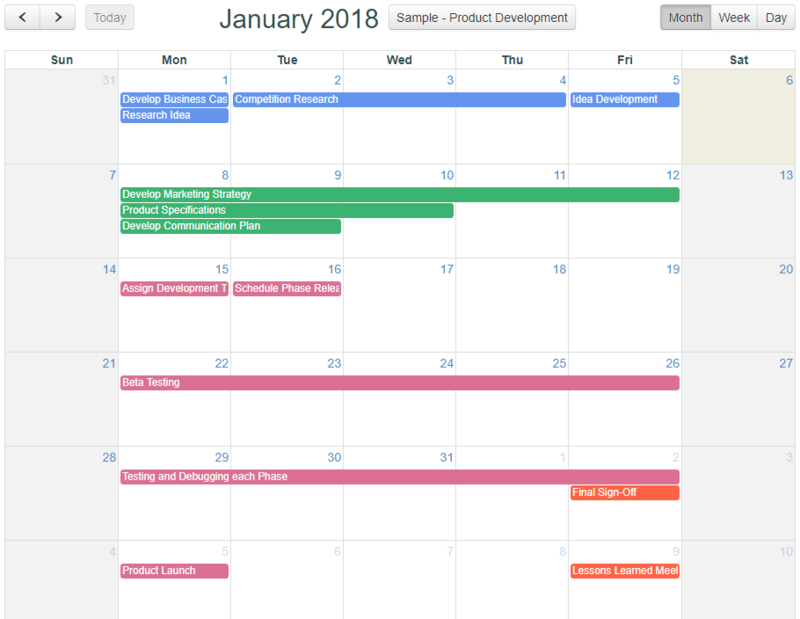 By using activity categories to group your activities on your dashboard, whatever colors you defined on the dashboard will also be shown on the interactive calendar, thereby giving you a visual reference to the categories. This feature is free with all of our versions, so feel free to check it out by signing up for our free personal version. Let us know how you like this new feature! Just use the contact page to drop us an email.